For anyone who loves Sherlock Holmes, Melvyn Smalls books are for you. He has taken Sherlock and given him a modern day makeover, without taking anything away from the sleuth that we know and love, except maybe that he now resides in Teeside. Dr. John Watson has written a book about the cases that he and Sherlock Holmes have worked on together. When he’s invited to talk about his book on the local radio station, BBC Tee, he jumps at the chance. However, on the day it was scheduled to be aired another author’s work is showcased instead. Watson, clearly not happy tries to find out why his slot on the show was pulled, but all he is told is that it has been deleted. 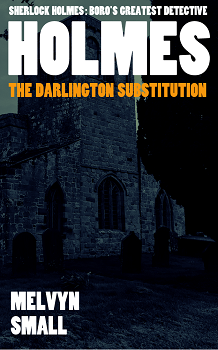 Holmes, though thinks that there is more to it, especially when it turns out that Watson spoke about a case that could be related to the DJ, Charlies Darlington. With Sherlock on the case, you can be sure that no stone will be left unturned until he has the answer he is looking for. The Darlington Substitute is a novella that is split into twelve chapters, all of which you can read for free via the link below. A chapter will be released, one at a time. Melvyn Small’s writing is superb. He has managed to capture every mannerism, and off the cuff remark, just as you would of expected from the original Sherlock in Sir Arthur Conan Doyles books. The whole book is around 65 pages long, so it only took me about an hour to read it. It really is a fantastic novella and I fully enjoyed it from beginning to end. Mel’s perhaps unique spin on Sherlock Holmes, which places the character in a different time, location and section of society, has found fans around the world and is fast becoming a cult classic. His writing style is pacey and littered with gin-dry humour. It has been described as “hilarious, clever and hugely enjoyable.” The Darlington Substitution novella is his longest story so far and perhaps his best work to date. This book is interesting! 😍 I’ll share it with my friend who likes Sherlock. With all these retellings and modernizations and reimaginings of classics buzzing about, it’s great to hear of a good one that rings true to a fan!! Thanks for the review. Seems to be an interesting read; let me check. Very good review Stacy as always! I always love when older books become modernized, it’s great to see where the author is going to take it. I watched Sherlock movies but never read anything. I do like a good mystery and that this is more updated version. Sounds good. I love Holmes and the hapless Watson. I am sure I would enjoy this one. I will keep a watch for this! I’ve always loved Sherlock Holmes, but I’ve never read any related books. I think I may need to change that! Great review! This book looks so good. Great review! Not exactly my kind of read, but I am glad you enjoyed reading it!